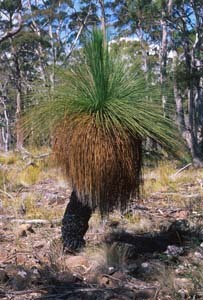 The only species of Xanthorrhoeaceae in Tasmania are three native species of Xanthorrhoea (grass trees). These all grow in dry forests and heaths and have very long (up to ~ 1m long), tough, narrow (~1-2mm) leaves in a dense tuft, overtopped by woody spike several cm thick and up to 3m tall. 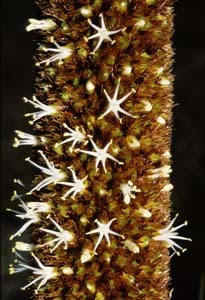 In one species (X. australis) the tuft of leaves is borne on a massive trunk (sometime branched) covered in leaf bases, this trunk can be up to 3m tall. 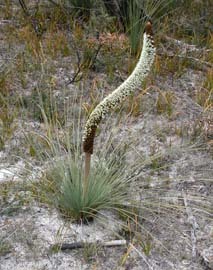 Lomandra was previously placed in the same family as Xanthorrhoea. 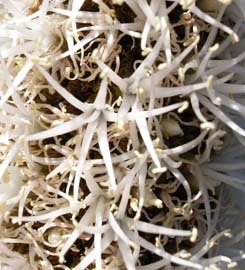 Xanthorrhoeaceae was once considered to be part of Liliaceae, which was a very artificial grouping of plants and has therefore been splintered in numerous families. 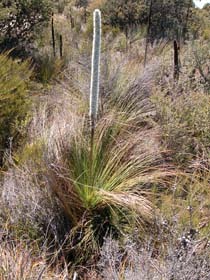 To see the fates of the other Tasmanian genera formerly in Liliaceae click here.